Bloomberg news has the effrontery to ask: Did Trump Just Start a Global Trade War? Although even MSNBC pit bull Rachel Maddow treats the President with more deference than Bloomberg.com, it’s still a fair question to ask. Judging from the way the stock market has flounced around recently, Wall Street’s answer to the question is an emphatic “maybe.” For once, the Street seems to have gotten it half-right. The bill Trump signed on Thursday will place tariffs of 25% and 10%, respectively, on steel and aluminum. Europe has responded by wondering aloud who Trump sees as the enemy. Not Canada or Mexico, to be sure, because they are exempt. 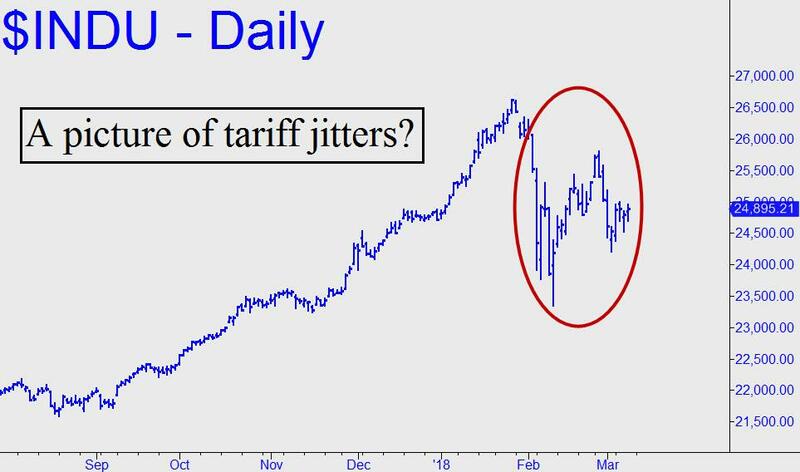 Significant as that may seem, it is overshadowed by the President’s promise to enact still more tariffs in the months ahead. There is no question that this will unsettle the markets for the foreseeable future and dominate the business pages, eventually moving to the front page above the fold. On days when stocks have risen, the talking heads and know-nothing pundits will give us reasons why Trump’s brand of protectionism poses no great threat to the global economy. But on days when stocks fall hard, their tune will change; they will blame Trump directly, and very loudly, for all that ails the stock market. My hunch is that at the end of the day –at the end of 2018, actually — the down days will outnumber the up days and stocks will be trading lower, perhaps very significantly so.